Peregrine Falcon Falco peregrinus in flight. Photo by Kevin Cole. The Newtownards (pronounced Newt-un–erds in the local Scotch dialect) that I remember was a small industrial town, nestling between Strangford Lough and a fold of small hills which rise no more than six hundred feet above sea level. The highest of these hills is called Cowie’s Craig, but the hill that dominates and shields the town is known by its Gaelic name - Scrabo (Scrabba) - the sward of the cow. The guide book for the town informs that it rises a mere 534 feet above sea level but that unremarkable figure can’t convey the importance of the hill to the culture of Newtown. The hill dominates the countryside and the addition of a tower merely added to its lofty profile. From a distance it looked like some gigantic beast, resting until the Day of Judgment. From the top of Scrabo Tower, on a clear day you can see the Mourne Mountains and the whitewashed cottages on the coast of Scotland. As children we pretended the tower was a fortress, built in ancient times to defend the town from the fury of the Northmen. In reality it is a memorial to the third Marquess of Londonderry, who helped to alleviate the suffering of the peasants during the Great Famine. The Londonderry family once owned the town and surrounding farms and lived in splendour at Mountstewart House, famous for its gardens created by Edith Vane-Tempest-Stewart, Marchioness of Londonderry in the 1920s. The link to the Vikings came to light when the tower was being built, halfway through the nineteenth century. Labourers on the site uncovered a burial cairn containing old Danish coins and the ashes of what we were told was some long dead Viking king. The Vikings were able to row their long ships to the foot of Scrabo and they named the Lough Strang Fiord (now Strangford). Presumably the King died during one of the many raids on the abbeys in the area. Alas the cairn was destroyed and the coins ended up in the museum in Dublin. We read lurid tales of Viking raids on these shores, how they plundered and pillaged and burned the monastery at Movilla, a famed seat of learning from the time of its establishment in 534 AD by St Finian. We secretly admired those fierce warriors from the North and in our headier moments would have imitated them, although we were restrained from plunder and pillage. Even earlier associations with mankind have been discovered and it appears that the Tower has been built in the centre of a large Iron Age fort. Tales of little people who lived on the hill were current in the early days of the twentieth century and some people talked of the green robed spirits of the ‘mountain’. It is no wonder that Scrabo was a lodestone for children and adults alike. Before television arrived to eliminate the outdoor pursuits of the townsfolk it was a place of pilgrimage, a place for quiet walks, for courting couples, a natural adventure playground and even a place for fire sacrifices. The hilltop was capped by basalt, which had flowed from an ancient volcano and formed its own peculiar shapes, one of which we called the Giant’s Chair. At Easter the whole population of the town appeared to head for the hill. From a distance it must have resembled an ant’s nest, with vast numbers of children moving about frenetically as befitted a place of magic. We took hard boiled, multi-coloured eggs with us and rolled them down the steep slope. When they broke we ate them and most likely left the shells to desecrate the sacred purity of the hill. This was a long standing ritual which disappeared when the local golf club threatened to prosecute (or was it persecute) trespassers. That remained a sore point in the community for years. As far as we were concerned our ancient right to Scrabo had been sequestered by the members of a ‘snooty’ golf club, most of whom weren’t even from Newtown. Much of the hill then was covered by whins, a thorny bush that made a virtually impenetrable barrier. 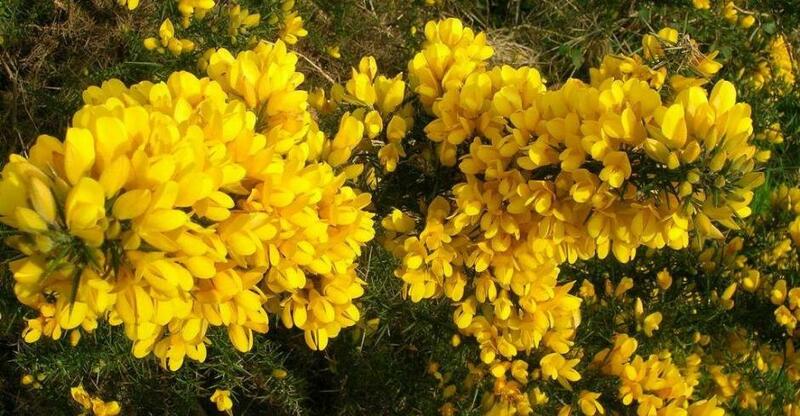 At Easter and afterwards, when the whin bush bloomed, its bright yellow flower was a source of dye for our Easter eggs. It was one of nature’s many miracles that such a nasty, painful shrub should produce a flower of such exquisite colour. During summer the whin bush dried and provided the perfect medium for the local pyromaniacs to gratify their obsessions. It was an annual ritual and when a fire broke out we would head for the foot of the hill to wait for the arrival of the local Fire Brigade. In most cases the fire was doused without difficulty, but during the infrequent hot summers it would threaten to engulf the whole hillside and reinforcements would come from Bangor and Belfast. Exploring the hill was a constant thrill and school holidays provided the time and opportunity to satisfy that passion. The hill had been a source of sandstone at least since the time of the Normans Scrabo stone occurs in a variety of colours, from warm, rich yellow, orange and deep red to paler grey and pink hues. All of the fine old buildings in Newtown were built from Scrabo stone. The town’s crowning glory, the Market House (Town Hall) is a magnificent example of how the stone could be used to create a building to rival any in Ireland. The stone came from quarries that had been abandoned long before I was born, so what was left was a gigantic hole in the face of Scrabo, with sheer cliffs hundred feet high. It had been a quarry from time immemorial according to Ted Griffith, an eminent local archaeologist, who later uncovered a treasure trove of ancient flints and polished stone implements. It was an awesome place. The cliffs cast an early shadow on the quarry floor on a sunny day and it was easy to imagine the little people crouched fearfully in the caves that dotted the cliff face, hoping to escape the wrath of the fair haired strangers. There was no apparent way up the cliff faces and I knew no one who had even attempted the climb. A path skirted the top of the cliffs but it was considered dangerous and we were warned to keep away. It is possible I would have heeded these warnings but for a series of events that almost ended in tragedy. Harry Ross, who lived in a little house at the entrance to the quarry, came to school one day bragging that he had seen two escaped convicts hiding in the Big Quarry. “Muh da sez they’re hidin’ fae the polis,” he explained, anxious to make the most of his fifteen minutes of fame. There followed a heated discussion as to why the Germans would want to spy on Newtown in the first place. Then Sammy Allen made the obvious suggestion. Harry wasn’t too happy with that idea. I suppose he wanted to keep that secret so that he would be the centre of attention for the next few days. There was no chance. We all joined Sammy chanting, “Show us, show us” until Harry caved in. By the time tomorrow came there was an excited crowd of children waiting outside the quarry. He waited for a minute or two but it was no use. Despite his entreaties no one wanted to be left out. In the end he reluctantly led the way into the quarry. Once inside the quarry we walked in single file up a rough track to the edge of the cliffs. Harry pointed triumphantly at a rude shelter made from leaves and tree branches. I could see Budgie’s point. Harry could easily have built the hut himself just to back up his story. Harry continued to protest loudly but most of the crowd drifted away. I stayed, half anticipating that something would turn up. We turned around. There were two elderly men, dressed in Donegal tweed jackets and brown corduroy trousers. They both wore tam o shanters and each had a pair of binoculars dangling from his neck. “Well, explain yourselves,” he demanded, in an educated Ulster accent. Budgie wasn’t one to be overawed by posh accents. His companion smiled but said nothing. I could see that Budgie had his dander up but I tugged at his sleeve and indicated it was time to go. Nevertheless he followed me down the track. “Whut’s an ornery jist?” asked Budgie. I just shrugged. I hadn’t a clue. We both laughed at that and ran on down the lane. I had to wait until my father came home before I found the answer to those questions. “A peregrine falcon is a bird of prey, but they’re rarely seen in this area.” said my father helpfully. “And you probably mean an ornithologist. That’s a person who studies birds. The next day I paraded my new found knowledge in front of my unimpressed classmates. “Wit a load o’ rubbish,” said Budgie and hawked contemptuously. The teacher’s arrival put an end to any further discussion. By the time school ended for the day I had forgotten about the two mysterious ornithologists and their peregrine falcon. Two cuts from Miss Patton’s cane concentrated the mind on more important things - like times tables. I was nonplussed when Budgie approached me after school. “Hey, c’mere. I want tae speak tae ye.” he said in a stage whisper. I followed him outside but he seemed in no hurry to tell me what the big mystery was. I tried to think of a plausible excuse but ended up nodding my head. It wasn’t a good idea to get on the wrong side of Budgie. That was the trouble with Budgie, he believed violence could solve everything. I suppose that’s why I hadn’t tried too hard to find an excuse. Mum was always curious when I wanted to eat early but I told her this time I was going to a football match. Budgie was champing at the bit when I arrived and he set off immediately. I wasn’t too keen on that idea but my motto is “in for a penny, in for a pound,” - sometimes. To my relief there was no sign of the ornithologists. The hide was still there but there were no immediate clues as to the whereabouts of the peregrine falcon. The hide was close to the ground so we had to crawl on all fours to get inside. Budgie showed no sign that he had heard me. He crawled around the hide and looked out in all directions. I just lay on my stomach and decided to humour him. He was pointing to the western side of the quarry. I crawled over beside him and looked in the general direction of his pointing finger. All I could see was the quarry wall. “See? Thir.” he could hardly contain himself. I peered intensely in the direction he was pointing but could still see nothing that vaguely resembled a bird’s head. He crawled out of the hide and ran back down the path into the quarry. I followed reluctantly. When I caught up with him he was standing under the cliff, pointing upwards. Without waiting for an answer he started scrambling over the pile of rocks at the bottom of the cliff face. There was no way I was going to follow but I decided to wait for him to come down. He’ll not be long, I thought. Nobody could climb that cliff. But I underestimated both Budgie’s climbing prowess and determination. Soon he was on the cliff face. He seemed to be able to pull himself up effortlessly. I was almost too frightened to look. No one, to my knowledge, had ever climbed up there before. “Here, ‘tis,” he called out. He was standing on a small rock ledge and I saw him put his hand into a crevice in the rock. Before Budgie could collect the egg, or whatever it was, a large bird flew towards him at breakneck speed. “Watch yourself,” I cried, but too late. The bird hit Budgie a powerful blow on the side of his head. Budgie swayed, grabbed thin air and with a blood curdling scream he overbalanced. For a moment he seemed to float backwards in a graceful arc and then his body plummeted to the ground. He landed with a sickening thud on a grassy knoll. His body was still and his right leg stuck out at a peculiar angle. I ran to him but he didn’t move and his face was like chalk. He’s dead, I thought. They’ll all blame me. I sprinted as fast as I could to the Ross’s house. Amazingly Mr Ross understood what I was babbling about and he went to Smyth’s farm and phoned for an ambulance. The ambulance men walked into the quarry and carried Budgie out on a stretcher. I was glad Budgie wasn’t dead and I ran home as fast as I could. I explained what had happened and I think my mother was so relieved she didn’t even think to punish me. Later I visited Budgie in hospital. He had his left arm and both legs in plaster but he was looking very pleased with himself. He was being treated as a bit of a celebrity by the nurses and he revelled in it. But I’m sure he had learnt his lesson. The John Street Heroes by Warwick Dalzell is on Amazon. (Kindle). It is a collection of stories about a gang of young boys who lived in Northern Ireland during the Second World War.